So the pattern has been written, the video is also almost done.. I worked until 4am this morning! I have been avoiding boy clothes because it's out of my comfort zone. I can make things like this just fine for my own pleasure but having to put it into written form for another to understand has always scared me a bit. But I have to press through that fear if I want to advance. I don't want to stay in my comfort zone forever no matter how comfy it is! So watch this blog, the pattern will be released just as soon as I get through the video. Thank you very much. I will be looking forward to the release. So exciting!! Once I saw this update on my fb, I got so happy to see that our cries has all been heard :D. Thanks so much! Sharon, you are amazing! I have a grandson who would LOVE a little boy bunny. Also, today my almost 2 yo granddaughter was here and when I showed her a shelf with maybe 5-6 amigurumi dolls sitting on it the only ones she wanted to hold were Dress Me Bunny and Little Big Foot Monkey (the only patterns that are yours)! She had no interest in any of the others. LOL! Thought you'd like to know your patterns are a hit! Great that you made these boy clothes. 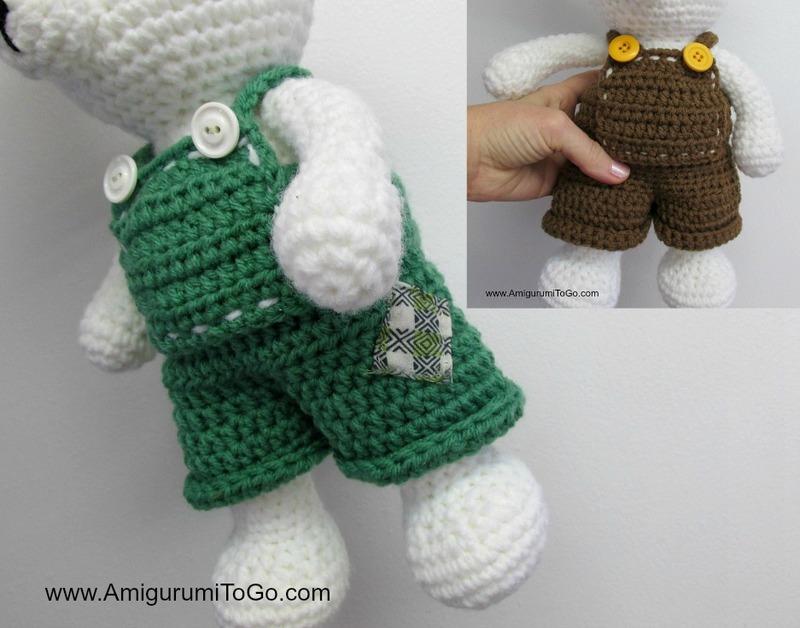 There are not so many boy crochet patterns. Thanks for all your work to make this pattern and video possible. I just wanted to tell you how much fun I have had making your little bigfoot animals. I wanted to share a Slideshow I did. Where can I send it? I tried to improvise some over the weekend, and ended up with my kitten playing with the yarn that ended up on every level surface in the living room, lol. Again, thank you so much for the detailed tutorials and the free written instructrions! Please accept my humble donation via paypal. I thank you very much for the donation, it is greatly appreciated. It will buy yarn and stuffing for more patterns! Oh so cute, I can make a boy and girl couple ;) Lovely! My name is Carrie and I have become so addicted to these little creations. I am one that had asked if you had thought of creating boy outfits for some of the dress up stuffies because my daughter keeps asking for pairs of animals so they have playmates. Thank you so much for taking it to heart.!!!!!! lol, I'm so happy you did Carrie! I'm just editing the video ending as we speak. Fingers crossed uploading goes smoothly so I'll have it published by the end of the day. The written pattern will be released same time as the video. Can you make a tie and suet for your bunny? Please. I can't wait to make these cute coveralls love your easy to follow patterns. Thank you for sharing. Wow, I've got good timing for once! I just started making the bunny (halfway through the body right now) and I wanted it to be a boy bunny. There dungarees are so cute - I can't wait to make them! (I can see the bunny having many pairs in different colours...) I'm so glad that you made this pattern, thank you!